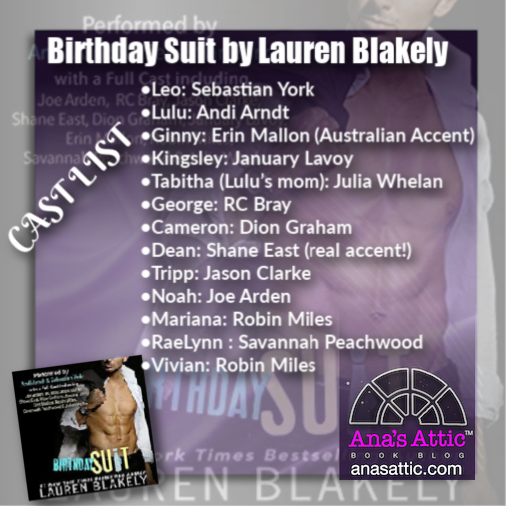 I know it’s still the beginning of January, but I declare Birthday Suit by Lauren Blakely the BEST AUDIOBOOK OF THE YEAR. 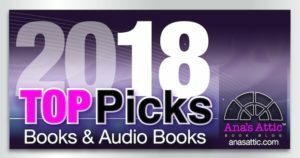 Seriously, there is absolutely no way to top this cast of 12 amazing narrators reading an already great Lauren Blakely book that also features CHOCOLATE. OMG, all of my favorite things! I was a little worried. I thought maybe the narration would be hard to follow or take me out of the story. That was never the case. At first, I didn’t even notice it, it was that smooth. I often find duet narration kind of jarring. It just sounds weird when you have another voice pop into a conversation. 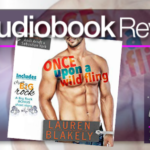 But Lauren Blakely writes for audio and she made it work brilliantly. Leo and Tripp were best friends. When they met Lulu, they both fell for her, but Tripp made his move first, and Leo stepped back, happy for his best friend, but harboring a secret love that would never see the light of day. The three of them were like the three musketeers. They were all three best friends, and Leo hid his feelings well. Unfortunately, Tripp had a drinking problem that ended his marriage to LuLu before it took his life. A few years later, Leo, who runs Heavenly Chocolates, is at a trade show looking for the next great talent when he runs into Lulu, who now has her own chocolate shop in New York. The banter between them is amazing. You are able to feel the years between them, the ease, the friendship, and something else. Something new, something a bit forbidden, at least in Leo’s mind. If Leo were chocolate, I’d easily add up the ingredients that comprised him. With a touch of pepper and a dash of spice, he’d be a strong, full-bodied dark chocolate, bordering on bittersweet. You’d pair him with a rich red wine and enjoy him by the fireplace. Lulu is not a neat freak. Lulu is like a suitcase that you sit on to try to close, but bright emerald-green scarves poke out the corners, a fuchsia-pink heel sticks out one side, and a polka-dotted dress spills from the zipper. Everything is a little bit messy and wild. These are excellent descriptions of the characters. I loved Lulu’s excitement for everything and her penchant for riddles. I loved her forward-thinking approach to life with no regrets to bog her down. Leo, however, was a different story. Despite Tripp being long-gone, he can’t help but feel guilty, like he is betraying his best friend. LuLu never thought of Leo as more than a friend, but she sure does now. But can Leo let go of the past and go all-in? 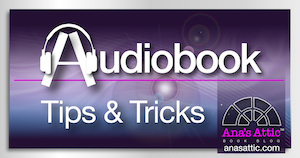 Listen to this book and find out! The Narration was absolutely the best ever. Chocolate! The whole story is about chocolate! Kingsley was Leo’s boss at Heavenly Chocolates and I totally loved her, her rivalry with her sister, and her playfulness. The flashbacks and current time switching was totally seamless and I never had any issue following along. The AMAZING interview and blooper reel at the end! Needed a little more Lauren Blakely sexiness. I was worried that 12 narrators would be overkill and hard to digest, but it was so natural sounding! Birthday Suit has by far the best narration I have ever heard in a book. Each person was assigned a character, and they were all so perfect for their roles. You will want to hang on to this cast list, it helped a lot! 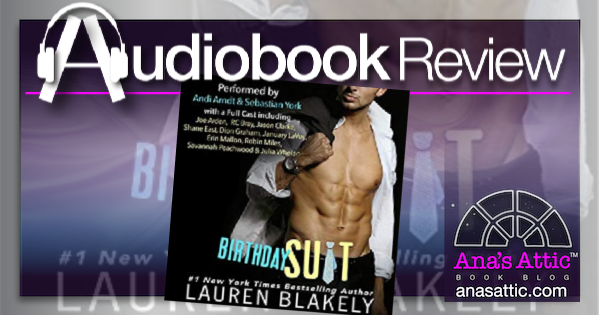 I thought Lauren Blakely ruined me for all other audiobooks before I listened to Birthday Suit. But now, with 12 narrators, there is no way to beat Birthday Suit!! If you have never listened to an audiobook, part of me says you should listen to this, because WOW. But then I worry that you will never be able to listen to anything else because seriously, this sets the bar pretty damn high. Birthday Suit isn’t just an audiobook, it’s a chocolate-covered experience. Don’t miss it!